Anyone who has a business likely has wondered about social media marketing and its cost. The reality is that social media is a powerful way to send out a message and attract attention to your brand. It is estimated that Facebook has 1.6-billion users worldwide. Twitter has 313-million. With numbers like this it is hard to discount social media in any marketing plan. Business owners everywhere are realizing this and incorporating it into their daily advertising. The question many people want to know however, is how much is the average social media marketing price. This number can vary. Obviously if you find a newer social media outlet just entering the market, their pricing will be much lower than, say Facebook. The outreach will be much lower also. One of the most important things to do is decide on what budget you want to use when creating your plan. Social media advertising costs can vary widely from media to media. Let’s start with Twitter. This is a tool that allows you to post 140-characters or less to your feed. You get people to follow you and you follow them online. The number of people using it at any given time are huge, so the value is high. Opening a new Twitter account is free. Paying someone else to maintain it can cost on average $1,000-$4,000 a month. If you have someone in house who can invest their time to it, you can save a lot on costs. If you do your own advertising with Twitter, expect to pay typically between $0.50 to $2.00 per click. Local campaigns average at about $1.30 per click. Whichever option you choose- outsourcing or in-house management of your Twitter account, you will be providing content. As with any outsourcing option, you are paying for the time it takes to post. A company will charge you hourly based on how many tweets you want per month, which is why the cost can vary so widely. A good company will not only offer you a tweet-package, but they also will offer you some Twitter Coaching, to set you up for long-term account management on your own. There is also the option of hiring a freelancer. With this option the average pay is about $35/tweet. You can do the math with that. If you want 20 tweets a month, then that adds up to $700. Some people like the freelance option because you can purchase as-needed and as-wanted. There are no long-term contracts to follow and it can be more affordable. Next, let’s look at Facebook. Again, this is a huge outlet with billions of users. On average, social media advertising costs for this media are about $2,500-$5,000 a month. Again- this is for paying someone else to open and maintain your advertising. It costs, but it is well worth it considering the amount of people you can potentially reach with just one post. If you choose to do it yourself, you can expect to pay on average $0.27 per click, with an average click-through rate of 1.5%. This is another option though that should be looked at critically. You can use someone in-house to do it and save money. You also can find someone to freelance the service. If you do freelance, the cost is about the same as Twitter- $35/post. So where do you start with your social media marketing plan? 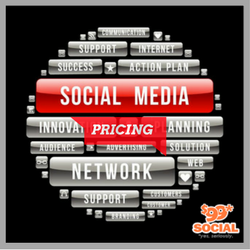 First of all, you should decide how much you want to spend on social media services pricing. As you can see from the numbers above if you want to outsource it, you can, but it will cost you a pretty penny. The value though is that you have someone else who manages the day-to-day of posting. As Erik from PersonalIncome.org mentions, managing your own business requires tough self-discipline, in order for it to succeed. This strategy frees up your time to focus on growing other aspects of your business. They’ll never be “too busy” or “too overwhelmed with other things” to do it—it’s their job, after all! They will know exactly what keywords to use (think Twitter) and how to get you the most for your posts. They also understand keywords and how to effectively use them. Next you should look at affordable companies that can handle social media marketing for you. Creative Social Posts is one of them. They charge on average $99-$499 per month. Another company is Friendemic where their hourly rate is $100-149. Also, SEO Image is another company that can handle your social media for the cost of $300+ per hour. There is a wide variation in pricing and it depends on the company’s reputation. A newer company that doesn’t have “proven results” yet, will be much more willing to negotiate hourly costs than an established company that has pushed their clients to viral media status. If you provide content, this can cut down on your cost. On the other hand if you want the company to create it remember that will take more time which will be reflected in your cost. If you are reaching out to a company and find their social media advertising costs are reasonable, still ask them to break down the strategy for you. What you don’t want is a “blanket package” that they use for all of their clients. You want something built just for you, your market, your business and your customers. Uniqueness is key! It’s easy to do the same thing for every client but does it really serve each one of them? Probably not! Plus, if you’re now paying for the service you want a strategy﻿﻿ that is ﻿custom﻿-made and a perfect fit. Some people ask why social media marketing prices are so high. The truth is that more people are using the internet for buying, entertainment and social activities than ever before. Let’s say you tell a customer in your business that you’ll be having a sale next Saturday. You hope that customer tells a few other people. With social media, if you have a following of just 200 locals and post it, that means that 200 people just got your message. If only 10% re-post it and they each have 100 followers, you just got your message to 2000 more people! It’s this power that drives the price of social media up and what makes it worthwhile. 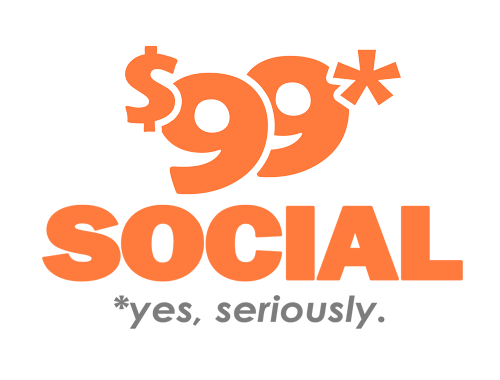 Get a customized social media marketing quote today by calling 99 Dollar Social at 1-866-653-4175.